From time to time, we miss-score a play or more. It throws off the whole serialization of the game. Things need to happen in order, or a scorecard, as you know can get WAY out of whack. 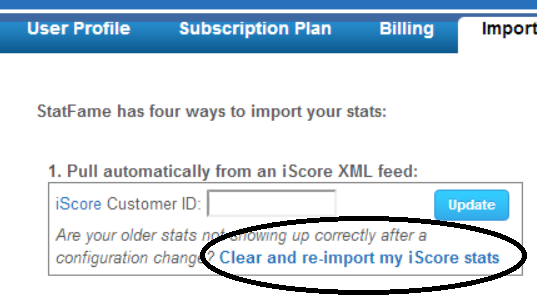 For that we created the “Clear and Re-Import” link from the YOUR ACCOUNT page or via logging in, clicking the “Import Data” tab, and clicking on “Clear and re-import your iScore stats” link. It’ll take up to 1 hour to re-import your data. If you have done this and STILL see the same results, give us a holler!